United Nations Day is October 24. There is no more enduring symbol of a nation than its national flag. It’s a thumbnail, an icon for a country. The flag symbolizes pride and rallies people. The flag is flown or lowered to reflect national joy or sorrow. Here are free printable world flags from around the globe. Use these free printable flag coloring pages in geography lessons and social studies cultures units. Students should not be allowed to "free color" the world flags. They should be taught to color them correctly. Coloring Castle has free printable flag coloring pages. There are black and white flags to color and colored flag templates that shows students how to properly color the flag. Countries represented include: Australia, Canada, China, Cuba, Czeck Republic, Denmark, Finland, France, Germany, Greece, Greenland, Hungary, Ireland, Israel, Italy, Japan, Netherlands (Holland), Norway, Poland, Sweden, Switzerland, United Kingdom, United States. Activity Village includes free printable world flags from the six of the seven continents: Asia, Africa, North and South America, Australia and Europe. The site has many free printable flag coloring pages from Algeria, Argentina, Austria, Belgium, Brazil, Cameroon, Chile, Cote d'Ivoire (Ivory Coast), Croatia, Cyprus, England, Ghana, Honduras, Hong Kong, India, Iran, Malaysia, Malta, New Zealand, Nigeria, North Korea, Paraguay, Portugal, Romania, Russia, Saudi Arabia, Scotland, Serbia, Singapore, Slovakia, Slovenia, South Africa, South Korea, Spain, Taiwan, Thailand, Trinidad and Tobago, Uruguay and Wales. Print geography lessons and social studies printables, coloring pages of famous buildings, landmarks and children in traditional native costume. Free printable geography lessons and social studies activities include maps and charts, too. World Flags Coloring Pages has free printable world flag coloring pages for just about any nation or country in the world. 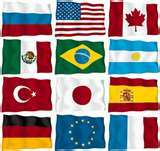 This site includes free printable United States flags from each state and provincial flags from countries around the world. Be sure to view the original to color properly. Enchanted Learning has many free printable world flags, national flag lesson plans and flag coloring pages. To print activities with no banner, users are asked to pay a $20 annual site fee. Check out these sites for free printable social studies lesson plans and geography lessons.